This is what I wore yesterday in Montreal. As I said before - the husband had a work conference to go to. I was meeting him for a reception after the conference was over yesterday, so I wanted to make sure I packed something other than jeans that would be appropriate for a work reception. This dress was the perfect canvas for layering - I ended up adding my oxblood moto jacket for extra warmth. I am extra obsessed with this scarf! 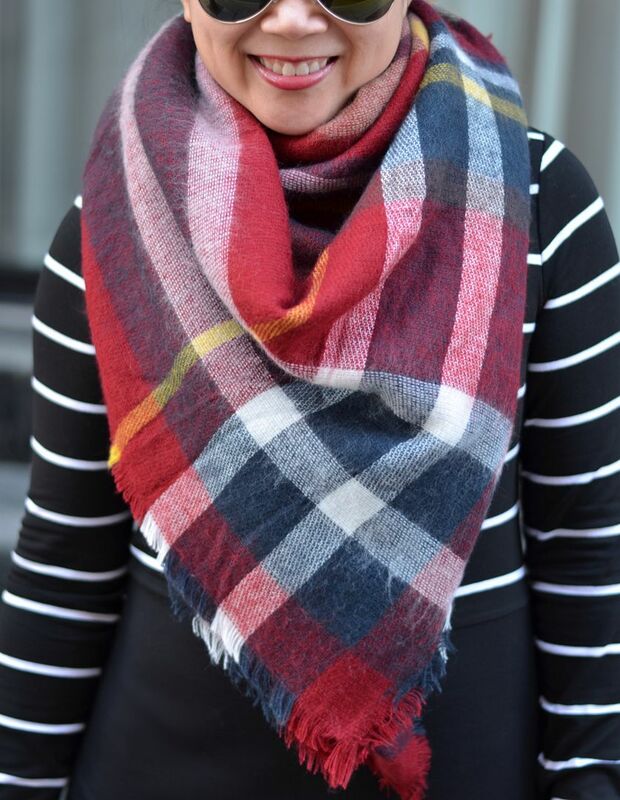 I bought an H&M dupe to the infamous Zara scarf last year, which spawned my scarf tying obsession as seen here with video tutorial here. A few weeks go, I browsed Zara's website to see if they had any current versions of the infamous scarf, and when I saw this burgundy version, I ordered it without another thought! It truly is a blanket scarf - it's a square shape, so it's even easier to tie than the other plaid one from H&M. Below is the graphic showing how I tied today's scarf. And to finish out my little recap of Montreal (part 1 here), I thought I would entice you with all the yummy things we ate on our trip. It's so great that we didn't have a car and just walked everywhere because I certainly needed to walk off the calories! For reals! Our room wasn't quite ready when we came to check in at the hotel, so we had a couple cocktails in the hotel restaurant along with a snack. 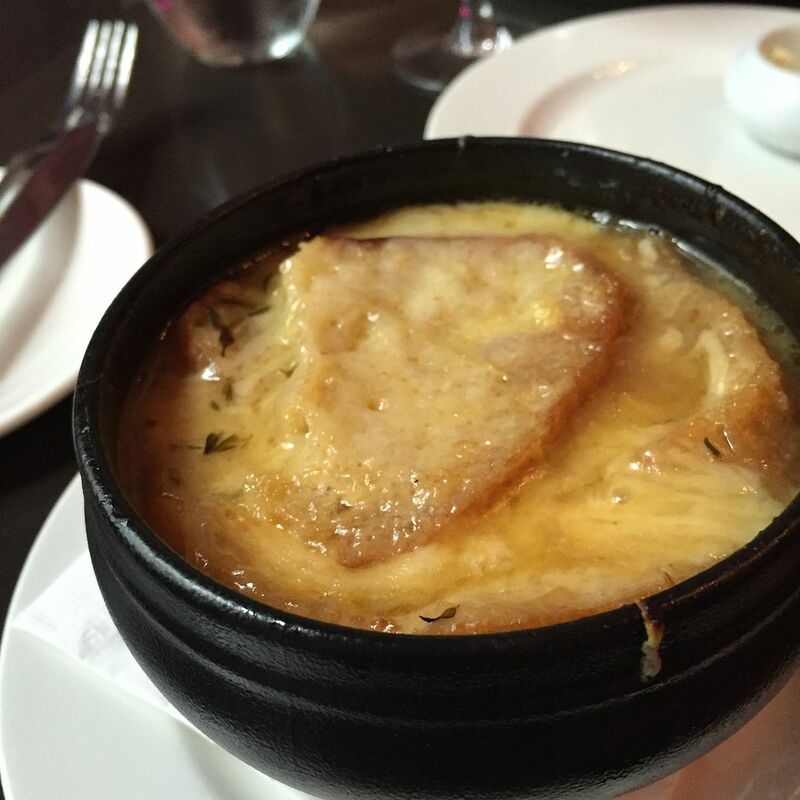 I lovvvvvve French onion soup, so you know I have to try it in an actual French city! And holy crap it was amazing! Everyone kept telling us we *had* to go to Poutineville, so naturally, we obliged. 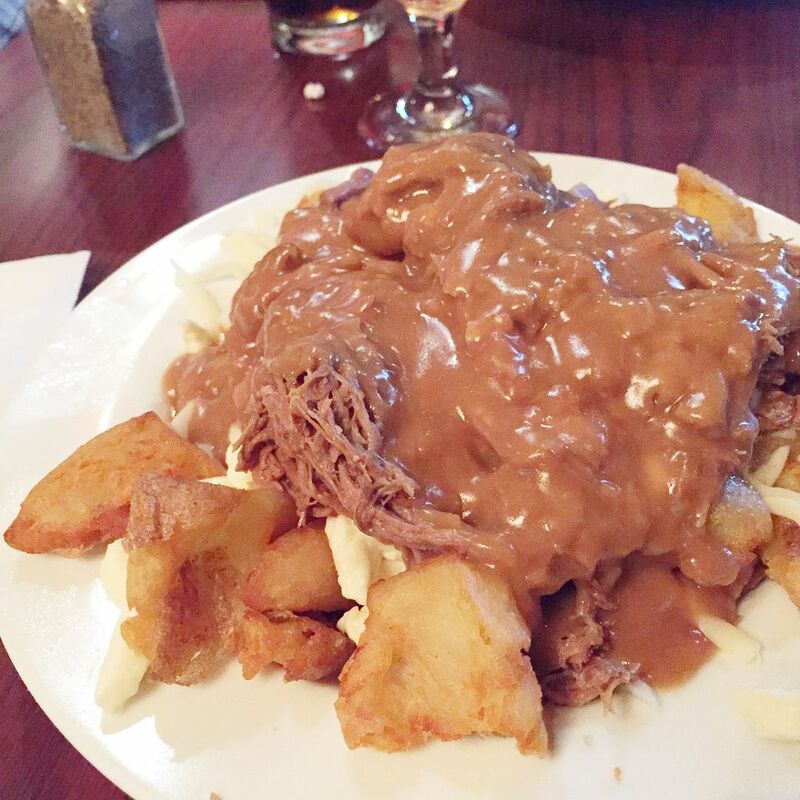 For those that don't know what Poutine is - it's basically potatoes (or fries) topped with gravy and cheese curds plus whatever other topping you want. 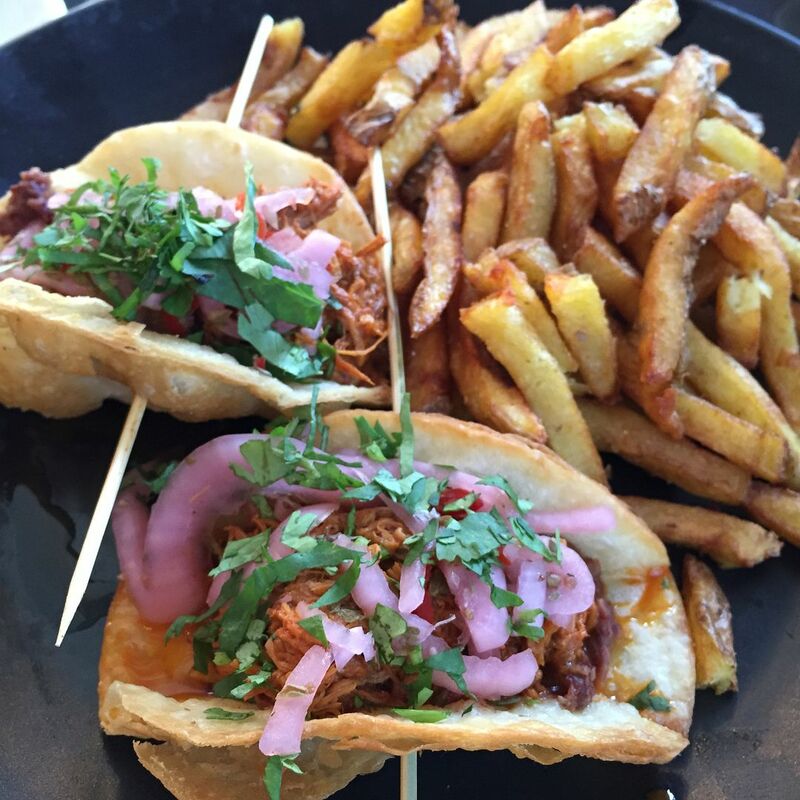 Comfort food at its finest! I'm a purest, so I just got their house special which was everything I listed above plus braised beef. It was amazing, to say the least. We ate at a brunch place called Le Cartet for brunch on Sunday. I love me some brunch, and the husband knows this, so he found this place on Yelp, which got excellent reviews, and I now know why! 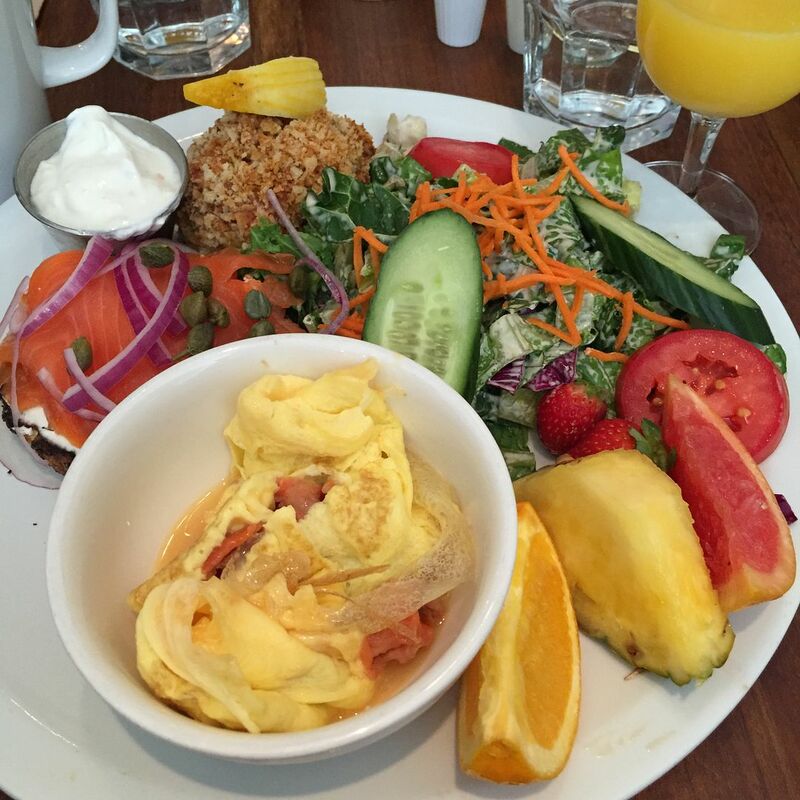 I ordered the L'Atlantique, which is basically smoked salmon served 3 ways - with scrambled eggs, with cream cheese on half a bagel, and then as a salmon cake (like a crabcake but with salmon instead.) Uh yeah, delicious, and I died. 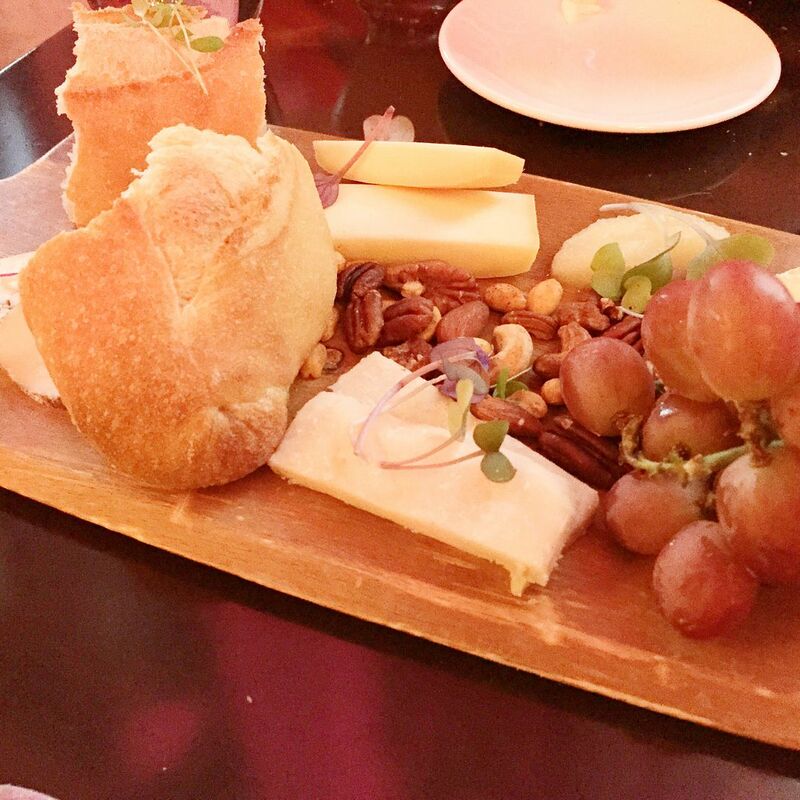 Our dinner reservations on Sunday weren't until 8pm, and since we had two free cocktails to use at the hotel, we had a couple of rounds of drinks at the hotel restaurant (called Suite 701) and snacked on this cheese platter. Also, I would not be surprised if I alone have eaten 23 loaves of bread since I've been here. Bread and butter is my weakness. We made reservations at Gibby's, which is a steakhouse. I am kicking myself for not taking a pic of my food - I ended up not getting steak, instead I ordered the Scampi which was about 3 small lobster tails served over some rice pilaf and a side of asparagus. Yes, I love my seafood. 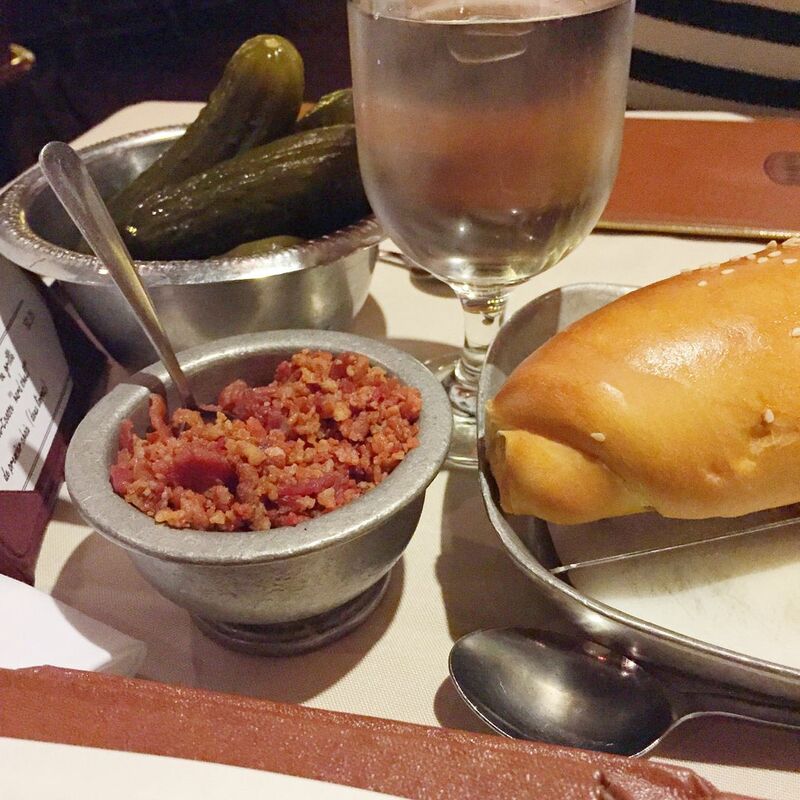 It was interesting though because as you wait, they not only served us bread, but also homemade pickles and a side of bacon bits. Don't mind if I do! I was flying solo for lunch yesterday since the husband had his conference, so I went ahead and just ate at the hotel restaurant again. I know, not really adventurous, but I really didn't have time to go venture out, unfortunately. 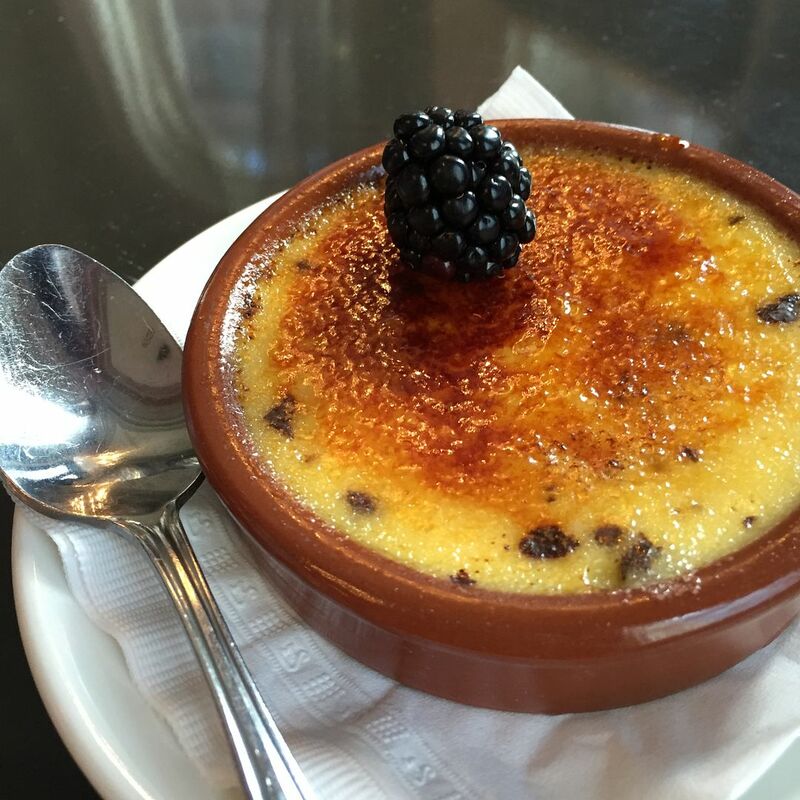 It's ok though because on top of eating MORE bread and butter, I had some pork tacos and creme brulee that actually had chocolate chips in it. For our last dinner, I was wanting some smaller bites since everything we had been eating so far was so heavy. The concierge told us about a new tapas place that was getting some good reviews, so we decided to try it. It was called Tapas 24. It was excellent! Definitely a great way to finish off our eating tour of Montreal! 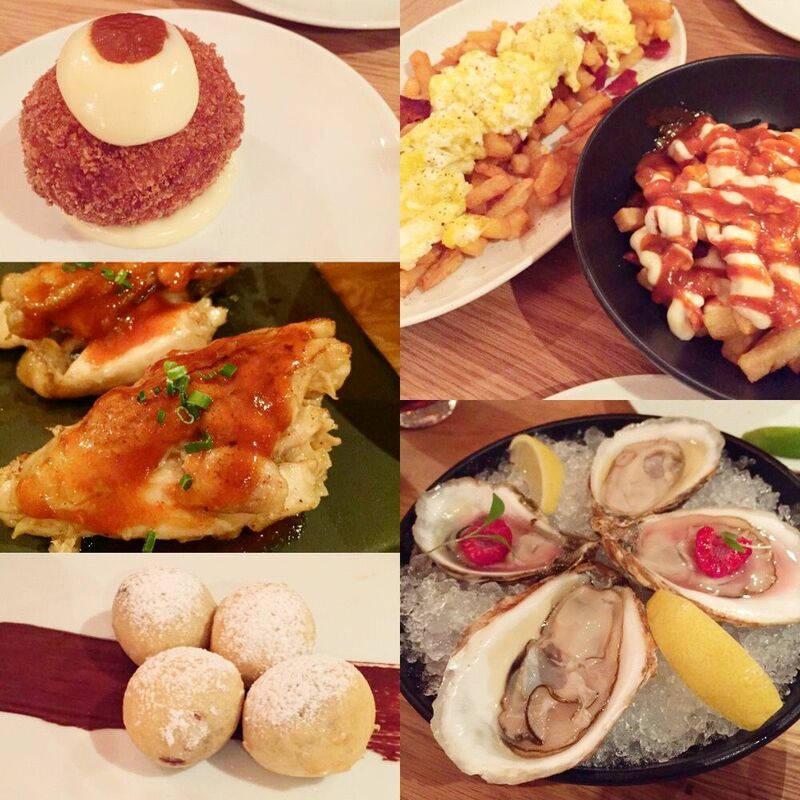 Clockwise from top left you are seeing: Croquette stuffed with meat and potatoes, fried eggs with chorizo and potatoes, fries with aioli and brava sauce, two kinds of oysters, chocolate fritters, boneless chicken wings. Do you see why I'm worried about calories!?? It's been such a fun and productive trip! Glad we were able to cram so much stuff in just a handful of days! Yesterday I recapped the places we saw. Today I recapped the things we ate. Naturally, the only thing left to recap is everything I packed and what I wore. Hope you'll be back to finish off this mini vacation series! Linking up for: Tremendous Tuesday, #AllAboutYou, Erin and Laura for Trend Spin Linkup. You look so pretty! 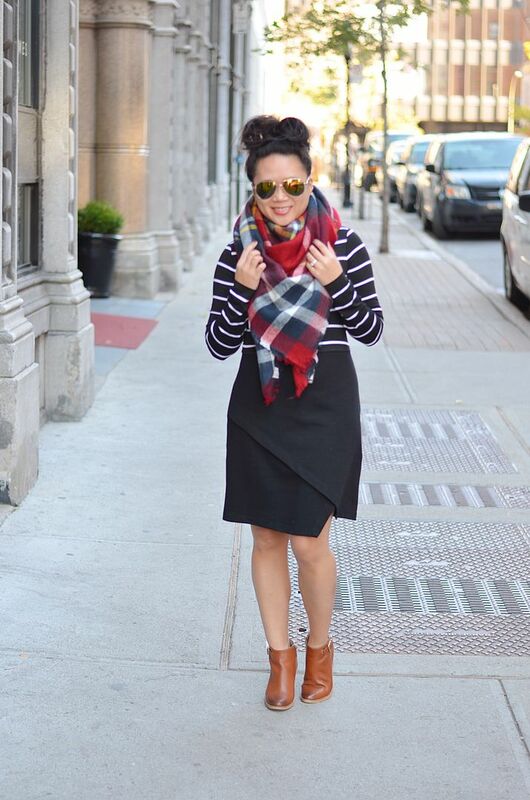 I love that oversized plaid scarf paired with the striped top. It's a great combo - I am addicted! OMG you are killing with all these food pics and that dress is so perfect. For a second i thought it was 2 separate pieces. Off to check out that Zara scarf. Yep- just a one piecer. I just love Bailey 44! The food is amazing! I've been so impressed by everything! Yeah matt was worried I would not like poutine. But it really wasn't anything more than just pot roast served over potatoes. But it certainly doesn't have a pretty look in photos! I still smashed it tho- it wasn't as rich as I was expecting it to be! I love seafood. I could eat it all day every day. Smoked salmon for breakfast is my favorite!!! Adore the outfit here...love the scarf with the stripes! And then the black dress with the cognac booties...sigh, perfection! Holy food...it all looks sooo good!! And you have to take advantage of the food the city offers, there's time later to burn the calories, right?!? All the food has been amazing! Yes I agree- I shall work this off when I get home! FOOD! This foodie got very excited when you hinted at doing this post haha. I feel you on the bread and butter, definitely my ultimate weakness too and cheese, lots of cheese. This trip looks like so much fun and per usual you look fantastic! Thank you! And thanks for popping over! Haha - sorry! It was all so good! Thanks so much for sharing how to do this. Was wondering if you purchased the scarf like that. Love this look by the way and the food! Yay - glad it was helpful! I bet that scarf kept you warm!! It is a perfect look with those fab booties!! Hope you had a great time, that soup looks DELICIOUS!!! Thanks again for linking up this week!!!! Yes it sure was delicious! And omg yes- warmest scarf ever! Love the stripes and the plaid!! Such a great fall combo! I agree- thanks for the affirmation! YES! It was all so amazing! P.S. Welcome by my blog today and please link up. Thanks. Everything looks so yummy, food is definitely one of the best things of a vacation, so many places, so little time right? And then who can really turn down an amazing piece of bread and butter. Seriously! We hit up an Irish pub before the airport and even that was so good! I love food and this post didn't disappoint! I've always wanted to try poutine and I would have been all over that bread too. And love the dress and scarf outfit. I need some darker scarves for fall/winter. I'll have to check out Zara. Yes you should! I know there are blanket scarves everywhere - but Zara has the best ones IMO. Looks like SUCH a fun city break - and you got to experience SO much. Although I probably shouldn't read this post so late at night...now I want a midnight snack LOL! 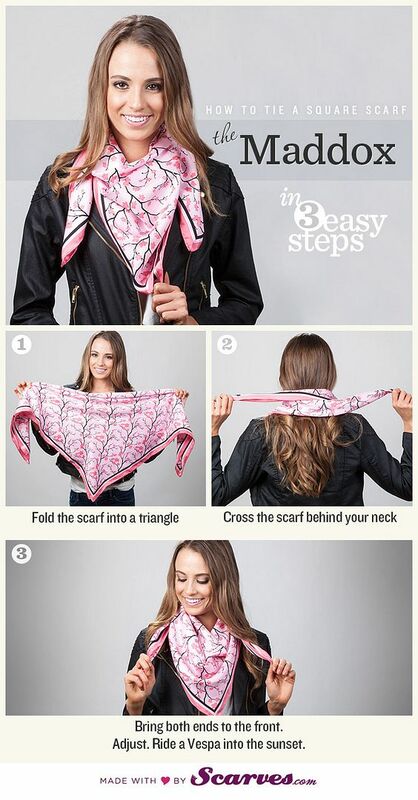 Thanks for sharing the scarf folding tips. I am always at a lost to how to do this. This is so easy and perfect for the square scarves! I'm totally not a scarf expert either, but I do have my couple of favorite ways to tie them!